4 Bedroom Semi Detached House For Sale in Banbury for Guide Price £550,000. 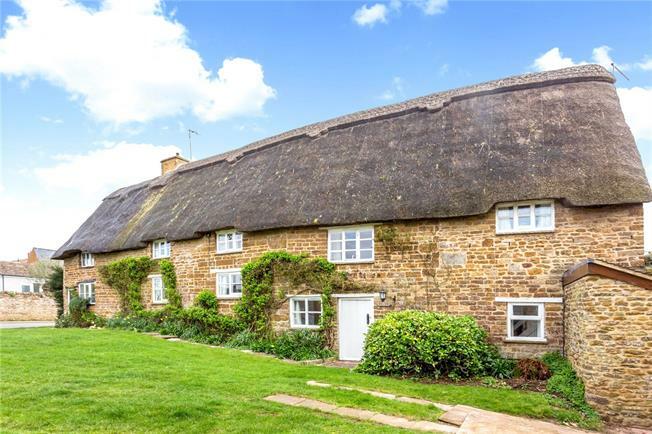 A charming Grade II Listed character family home centrally situated within this popular well served village to the east of Banbury. The property offers flexible living accommodation over three floors with a wealth of character features throughout. The entrance hall gives access to an open plan sitting & dining room with an Inglenook fireplace and stove, character beams and exposed stone. The kitchen/ breakfast room offers a range of eye and base level units, access through to a utility area and onto the family room. This is a lovely light room with vaulted ceiling, views over the garden and could be used as a fifth bedroom if required as there is a wet room. In addition there is a further garden room which gives access to the front and rear of the property. To the first and second floors there are well proportioned bedrooms, one with an ensuite shower and in addition there is a family bathroom. Middleton Cheney is one of the largest settlements in the district. Facilities within the village include a chemist, three churches, library, bus service, village store, post office & public houses. The village hall offers a range of clubs & societies, & there is secondary & primary schooling in the village itself. More comprehensive facilities can be found in Banbury. The M40 offers road links to both Birmingham & London (via Jct 11), & there is also a mainline railway station offering access to London. The front door is approached via the small green with character paving stones. The rear garden is divided into a large terrace area which flows beautifully from the property ensuring an ideal entertaining area. The main garden is mostly lawn, it offers a peaceful and private haven with numerous well stocked perennial flower and shrub borders providing interest and colour throughout the seasons. The garden is private and enjoys the sunlight throughout the day. Thatched and Grade II Listed.